Science gifts aren’t always easy to find. So, when you come across a shop that really gets it. You want to throw as much support at them as possible. The following list features some of my favorite items that I have purchased over the years. You will be supporting small businesses if you purchase anything on this list. Each store is managed by a creator who loves math and science as much as you do. I hope you will find these science gifts as interesting as I have. I have purchased so many items of jewelry from this store.The owners are local to Portland, and I love supporting artists from the community. I’ve purchased most of my charms from them at one point or another. I really should ask for a wholesale discount! I like to wear this pendant and see if anyone gets it. Not science related, but still cool. They make wonderful custom jewelry. I fell in love with this necklace representing the character of Lafayette from Hamilton. I felts so lucky when Nicole agreed to do an interview with me about her shop. It has a distinct statistical flavor. Not surprising, the owner has a Masters degree in Statistics! Legit. Nicole makes adorable Normal Distribution plushies. I purchased this T-shirt this year. I’ve also made this cross-stitch pattern. Hanging in my bedroom are five portraits of the scientists who have impacted my life the most. All gorgeously designed by Megan Lee. I also have her poster featuring 16 women scientists. I just discovered that she makes custom items. Is a G.H Hardy poster in my future? So, I had to get this. This list needs more math gifts! I will give a warning that if you visit this shop it is somewhat NSFW. They sell all types of piercings. Just saying. But it is totally worth a visit to pick up these math earrings. Michelle is also a talented jewelry maker. Her pieces are beautiful. I picked up this ring which features the digits of Pi. She also sells many other math and science items! I run an Etsy shop that sells mathematical bookmarks. I am currently on hiatus while I work on creating more inventory. Check out Mathysphere if you like that style. Geri has wonderful patterns including some that are pride friendly. Really cool. I bought two patterns myself. I’ve started using a journal/diary/planner hybrid using the Bullet Journal method. My favorite thing is to decorate my entries. 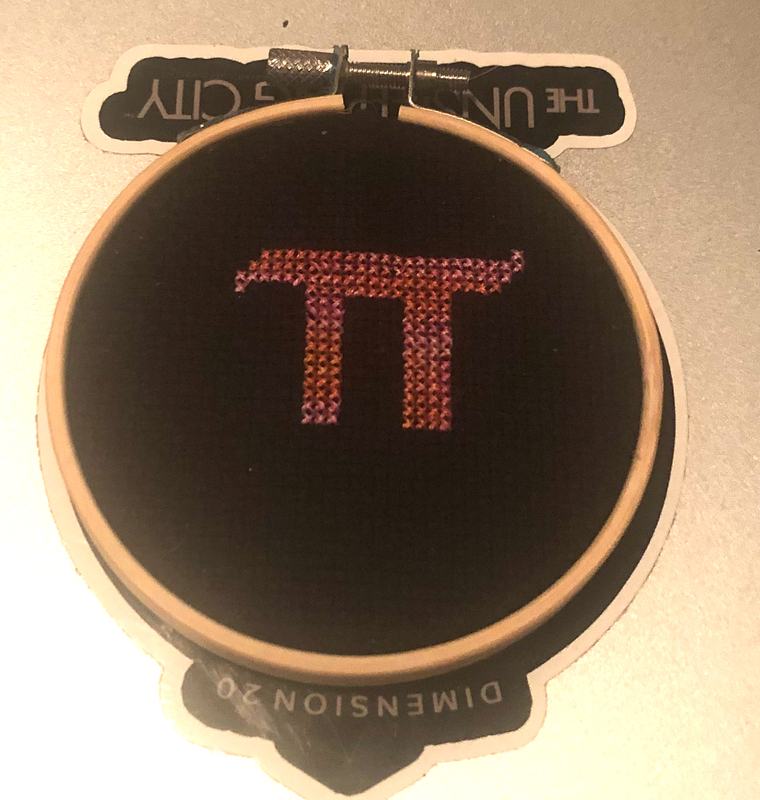 I’ve picked up several math gifts from Tesla’s Etsy shop for just that reason. This is your shop if you are looking for pure mathematical gifts. There is some amazing creative stuff in there. And, they sell out. They are based out of the UK but they will ship to the US. As a role-player, I had to add these special non-transitive dice to my collection. Can’t use them for games. Entertaining to bring out when you are waiting for something though. Science gifts are more plentiful than we may think. For example, Etsy is a popular marketplace for science, mathematical and other unique gifts. When you purchase from them, you are supporting small businesses – making it a win/win for everyone.. If you liked this post, consider subscribing. Have you found any interesting shops that sell science gifts? Next Post: What do Consciousness and Science Share?